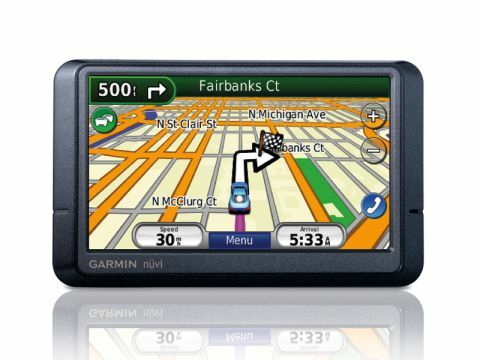 Garmin made its name in navigational devices for boats and ships, so has plenty of sat nav experience. The Nüvi 265w is an attractive device with a 4.3-inch touchscreen. The widescreen aspect ratio makes the integrated maps incredibly easy to view. It's one the slimmest sat-navs available, at £165 (inc. VAT), is also the most expensive. Aside from the power button on the top of the device and an SD card slot for adding extra maps located on the left-hand side, there are no distinguishing marks on the body. This keeps things simple and neatly focuses the eye on the screen. The antenna is built in and you'll find the now standard SiRFStar III GPS chipset in place. Maps of the UK and Ireland come pre-installed, and there is street-level mapping for most major roads across Europe. It's easy to switch between 2D and 3D maps, and with plenty of scalable features, such as Points of Interest (POI) and speed camera alerts, you'll find it a very useful device. The route planning software is fairly intuitive and the big display makes it easy to enter postcodes or use the onscreen QWERTY keyboard to type in addresses. There is support for seven and eight-digit postcodes, so it offers a wide variety of data entry methods. The battery offers up to four hours of use, and a cigarette lighter adapter for your car is also included in the package. At home, you can connect to your laptop using USB to recharge the battery. The Garmin has a nice bright display and is quick to set up and install. If your budget allows, the Nüvi 265w makes excellent sense. Its usability is great and the battery life more than acceptable.